The classic pose of the Heisman Trophy is renowned among athletes and fans. It is an easily recognizable pose, which many tend to emulate in their own style. Quarterbacks, running backs, and receivers are known to strike the pose both for a photographer but also on game day out on the field in the heat of battle. Such was the case this past Friday night on the high school field at Lehighton. Pleasant Valley traveled to face the Lehighton Indians, and both teams were 2-1 coming into the matchup. Austyn Borre gained 132 yards. 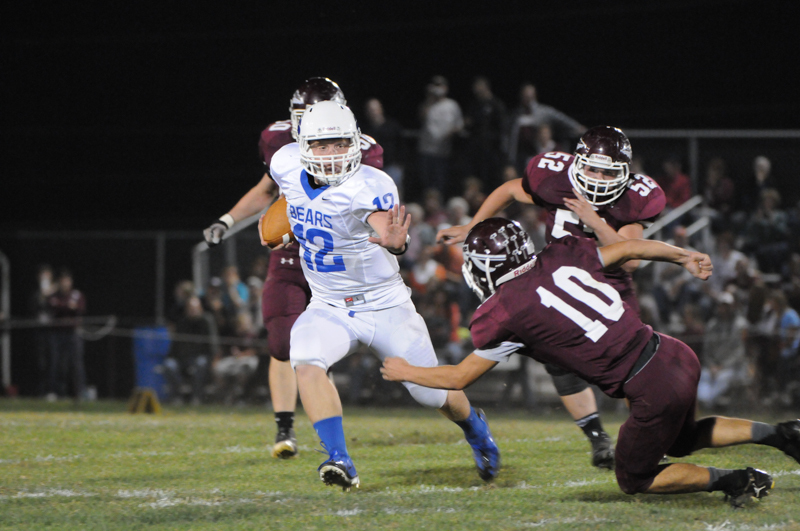 Brandon Leap carried for some yardage gains, too, and in this photo he is shielding himself from Lehighton’s Tyler Cann. Leap is running to the right and displaying that classic Heisman Trophy pose! This photo and one of Borre appears in the Pocono Record today, Sept. 21, 2013. You can check it out here. Got game? Brandon Leap and Austyn Borre did Friday night under the lights in Lehighton! Tagged Football, Heisman Trophy Pose, Lehighton High School, Pleasant Valley High School, Pocono Record, Sports Photography. Bookmark the permalink.